We use oxygen-18.1.0.0.jar, and we need to execute a specific action each time users accept a review in our application. In fact, this action will update a "table of modification" in the document. 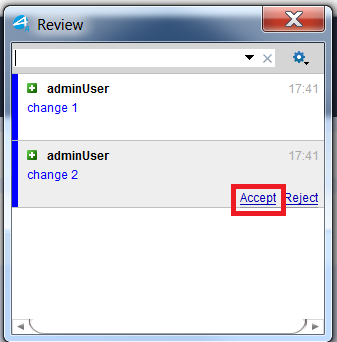 I success to override "Edit/Accept_Change" in the Review toolbar but we also need to override the "accept" action in the Manage Reviews panel. I don't find how to do that. Can you explain me how can I improve this "accept" action, please ? Thanks for your answer but I don't understand how it could solve my issue. The 2 methods you provide only allow to customize the contextual menu actions and the hover actions. But I need to customize the "accept" action in the Review Panel. // TODO This is the accept action. You can replace it with another one.